A contract signed today will see Scottish renewable energy consultancy, SgurrEnergy provide expert support for the development of the first offshore wind farm in the Guangdong province, China. The contract, which will be delivered over two years, will see SgurrEnergy, part of Wood Group, advise the Guangdong Electric Power Design Institute (GEDI), one of China’s leading design institutions, on its landmark Zhuhai offshore wind farm project. The company, along with offshore experts, Wood Group Kenny, will advise on areas such as wind farm layout, site selection and design, ocean hydrometeorology and will conduct an Environmental Impact Assessment. Witnessing the signing in Beijing today as part of his visit to strengthen trade and investment links with China, Humza Yousaf, Scottish Minister for External Affairs, has congratulated SgurrEnergy and highlighted its success as an example of how Scottish companies are providing both know-how and technology to support the growing Chinese renewables industry. Speaking from the Chinese capital, Mr Yousaf said: “SgurrEnergy already has a very strong track record of providing renewables expertise, knowledge and technology to China as it works towards meeting its green energy targets, and this announcement is great news for both countries. This latest project builds on SgurrEnergy’s strong track record for the provision of consultancy on offshore wind development in China. The company was involved in the Jiangsu offshore wind farm project and has worked alongside the main Chinese utility providers via the World Bank’s China Renewable Energy Scale-up Programme and EU Aid China. Cathryn Chu from SgurrEnergy’s Beijing office, said: “SgurrEnergy has been involved in the Chinese offshore wind industry since 2007. Our knowledge and experience gained in China, together with our advanced technical capability in offshore wind from Europe, has been key in the success of this partnership with GEDI. Anne MacColl, Chief Executive of Scottish Development International, is also in Beijing promoting Scotland’s trade and investment agenda. She said: “Scotland has some of the best renewable energy resources in the world, which coupled with our strengths in innovation and the engineering excellence, developed over the past 40 years since North Sea oil and gas discoveries, have helped make us an internationally competitive global energy player. 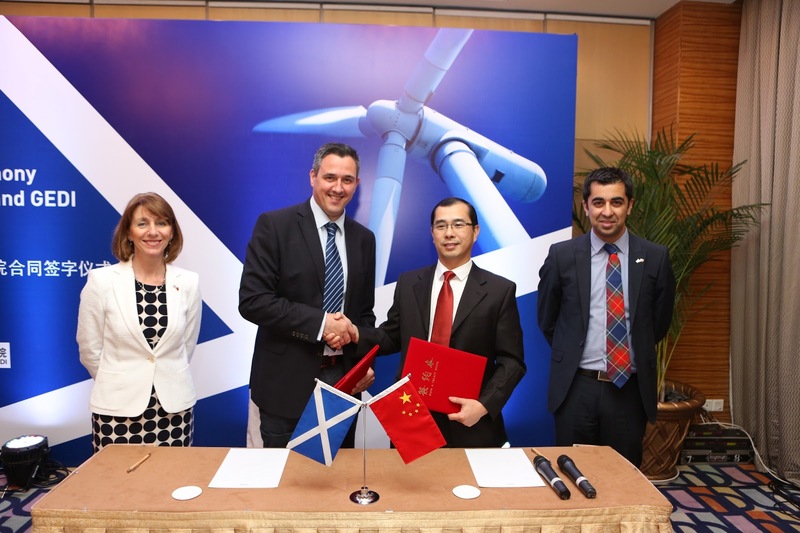 “Scottish Development International has been working closely with the Scottish renewables industry to take a closer look at how to apply its innovation and experience to the Chinese market.